Opinion Forum » Who Is More Powerful: Technology or Parents? Who Is More Powerful: Technology or Parents? Technology may be the most powerful force in the world today and, as the noted technology historian Melvin Kranzberg observes in his Six Laws of Technology, “Technology is neither good nor bad—nor is it neutral.” Technology isn’t neutral because it does, clearly, have an impact on our lives. The nature of that impact is what determines whether technology is good or bad. When I speak about technology, I am casting a wide net that encompasses gadgetry both quite old and very new. Technology to which I refer includes oh-so-20th-century media such as movies, radio and television. It also includes more recent developments in computers (desktops, laptops, and tablets) and communications (e.g., mobile phones and GPS). Technology, in its latest iteration, comprises the Internet and the entire universe of information that are now at our children’s fingertips. Technology influences your children (and you) both indirectly and directly. First, it acts as a conduit through which popular culture inserts itself into your children’s lives. Popular culture has certainly changed over the last two decades, but the means by which it can reach children has changed even more. Thanks to the proliferation of communication technology that has grown exponentially in the last twenty years, for example, the birth of the Internet, the proliferation of smartphones, the emergence of viral marketing, and the explosion of social media, popular culture is now an almost inescapable presence in your children’s lives, enabling it to influence them more often, more directly, and more powerfully than at any time in the past. Second, as Marshall McLuhan suggested so presciently in 1964, “the medium is the message,” meaning that, beyond the content that is conveyed, the medium itself has an impact by its very nature and unique characteristics. He asserted that we are so focused on the content of the technology that we neglect to notice the influence of the technology itself on people. This observation is certainly true today with the emphasis on what technology provides, for example, video, text messages, and social media, with little consideration to how the very act of using these advances shapes us, for example, expectations, attention, and redefinitions of self and relationships. All of the developments in technology of the past two decades are having effects on our children in so many ways, including cognitively, emotionally, socially, culturally, and physically. Researchers in such diverse fields as computer science, psychology, sociology, philosophy, and the neurosciences are only beginning to explore these medium-not-content issues and study how McLuhan’s thesis applies to the most recent technological developments. A bit frightening perhaps, early investigations on the impact of technology on children are indicating that many parents whose children are, as digital natives, immersed in technology don’t even consider the ramifications of either the content or the medium on their children’s development. Technology is pretty darned powerful, to be sure. But parents aren’t necessarily 90-pound weaklings either. It all depends on whether parents decide to flex their child-rearing muscles. 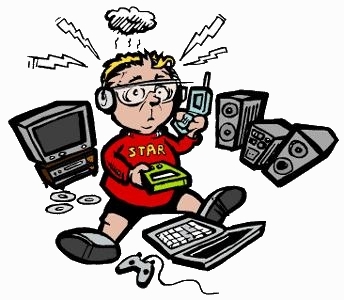 So what are we as parents to do so our children don’t drown in the tsunami of technology that is overwhelming them? We can’t turn back the clock. We can’t raise our children in caves. We can’t teach them that technology is evil, because it isn’t. Technology is just a tool and it is what we do with it that determines whether it helps or hurts our children. At the same time, we can’t just sit back and let our children be influenced willy-nilly by technology. To do so would be to naively believe that it offers only benefits and no costs. To do so would be to put our children at the mercy of the uncertainty and capriciousness of technology. Such an attitude would place far too great an onus on our children to decide what technology to use and how to use it. It would place an unrealistic amount of trust in our children that they have the capacity to separate the rewards from the risks. To add insult to parental injury, the reality is that because of the growing impact of technology we just don’t have the influence over our children that we once did. In generations past, parents had an easier time controlling their children’s lives (in the good sense) because there were fewer outside forces trying to insert themselves into their families’ lives. Homes used to be largely impervious to the cultural “elements” (radio and television were the greatest intrusions); now, homes are largely permeable, with cable wiring and satellite transmissions breaching the literal and metaphorical membrane that exists between home and the world beyond its walls. This diminishment of impact over your children shouldn’t cause you to wave the white flag in surrender; to do so would be to give up on your children. How often are your children immersed in technology? What is the quality of content to which they are exposed? To what degree do you provide limits and guidance in your children’s interactions with technology? How much counterbalancing exposure do your children get from positive influences and experiences? As you explore the role of technology in your children’s lives, you should use these four questions to help judge whether technology is beneficial or harmful to their development.